Dubai, UAE, June 27, 2018: As part of its ongoing commitment to inspire the next generation of cyclists, UAE Team Emirates has partnered with Dubai-based sports activity provider Just Play, to launch the UAE Team Emirates Youth Academy – a summer cycling programme, hosted at this year’s Dubai Sports World. The three-week initiative – which targets boys and girls from 11-16 years-old and starts on Sunday 8th July – coincides with the world’s most prestigious cycling race, the Tour de France. The coaching clinics will teach youngsters the basics of indoor cycling, using professional training bikes in a purpose built, air-conditioned studio. Each session has been designed in collaboration with UAE Team Emirates’ staff and the team’s top riders – two of whom were present at today’s launch. 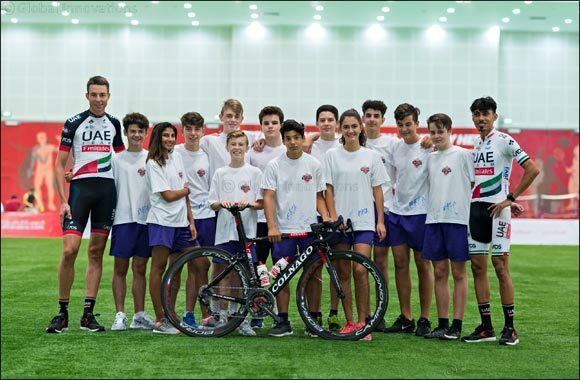 UAE and Asian Road Cycling Champion Yousif Mirza was joined by UAE Team Emirates teammate Vegard Stake Laengen at Dubai Sports World as the pair met the first batch of UAE Team Emirates Youth Academy participants from Sunmarke International School. The duo gave the enthusiastic youngsters some eye-opening insights into the world of professional cycling and a taste of what their teammates will be going up against in the coming weeks, as they battle the toughest race on the tour. The pair also provided useful tips on technique, shared memories of cycling as youngsters, and talked about what it takes to make it to the top, before they hopped on their bikes to demonstrate just how much power is in the legs of the elite rider. The daily coaching clinics – running Sunday to Thursday – are themed around the 21 stages of the Tour de France and give youngsters the chance to experience some of the same conditions faced by UAE Team Emirates’ riders competing on this year’s tour. The youngsters will learn how to perfect their climbing, sprinting and endurance skills, whilst building their overall fitness in a fun and safe environment as part of Just Play’s well-established summer camps. The UAE Team Emirates Youth Academy will run as part of the official Dubai Sports World Summer Camp programme from 8th – 29th July 2018, delivered by Just Play.